For those looking for an audio recording solution for their video DSLRs, Tascam's new field recorders DR-05X, DR-07X and the professional DR-40X may be worth a look - all featuring significant improvements over the previous models, including a new user interface, new features and more direct operation of key features. All three record WAV or MP3 (with a bit rate of 32-320 kbit/s) with up to 96 kHz / 24 Bit via MicroSD card (maximum 128 GB) and can be used together with software as USB audio interface with a Windows or Mac computer or iOS device for livestreaming or direct digital audio recording. 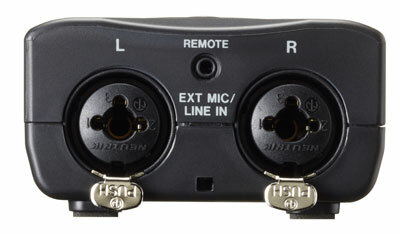 In addition to the built-in microphone, external microphones can also be connected via stereo mini jack (DR-05X/DR07X) or via XLR/jack (balanced with 48 V phantom power). All models feature a headphone/line out output for audio monitoring of the recording, a USB 2.0 interface for connection to a PC, built-in speakers, three different automatic functions for level control (limiter, peak reduction, auto level), 2 seconds pre-recording, auto recording (recording starts and stops when the input signal passes a certain threshold level), automatic level adjustment, six reverb effects that can be added to the input or output signal, variable playback speed, depth filter, tuning function and more. The new dictation mode allows easy forward/backward playback with pre-set time intervals. The power of the 2 (or 3 on the DR-40X) AA batteries is sufficient for about 18 hours of operation, alternatively the recorders can be powered via USB or the optional 5V PS-P520E power supply. The field recorders can be mounted on a desktop or microphone stand using the 1/4-inch tripod adapter on the underside. The smallest new model is the DR-05X. It has two fixed omnidirectional omnidirectional microphones in AB configuration and can record on 2 audio tracks. The Tascam DR-05X costs about 130 Euro. 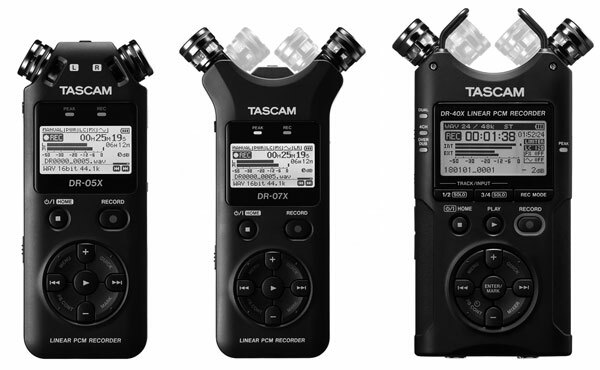 The Tascam DR-07X, which costs around 160 euros, differs from the previous model only by the two microphones with unidirectional cardioid characteristic, which can be swivelled in contrast to the DR-05X and can therefore be used in AB or XY orientation. The rather professional model Tascam DR-40X is the largest and with 282 g heaviest. It also has a swiveling AB or XY cardioid microphone and - as the only one of the new models - four recording tracks, which allow it to record sound simultaneously via the internal and external microphones or a source with two different levels. The DR-40X can also be remote controlled using Tascam's optional RC-3F footswitch and the RC-10 wired remote control. The Tascam DR-40X is available for about 215 Euro.